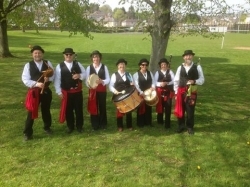 Cumbria Gaita Band - Who are the Cumbria Gaita Band? Who are the Cumbria Gaita Band? Based in and around Kendal, Cumbria, England, we play Galician bagpipes (gaitas), accompanied by Galician-style percussion. Available for fairs, festivals, carnivals, processions, fetes, openings, weddings, ceilidhs and parties.